The upgraded Pagoda Resort and Spa is a top venue to consider for your wedding accommodation and / or reception. Centrally located in Como it is a short drive to Perth city or South Perth with access to the Como foreshore for a walk along the Swan River. 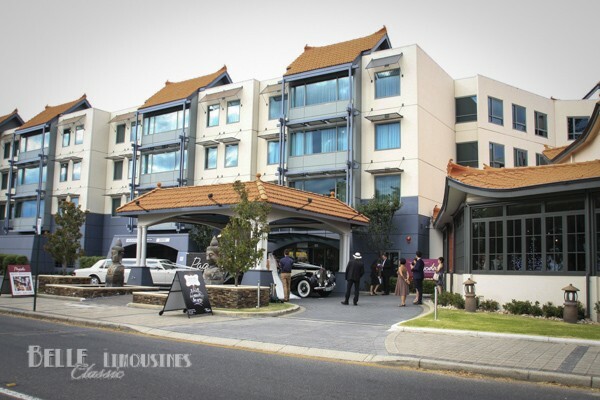 The Pagoda Resort is also popular for tourists holidaying in Perth and is ideal for a romantic weekend get-away. As a reception venue the Pagoda has a range of reception rooms and will cater for smaller weddings as well as larger reception groups. The wedding coordinators at the Pagoda are friendly and professional so it is worth paying them a visit to check out the venue and discuss the options available. 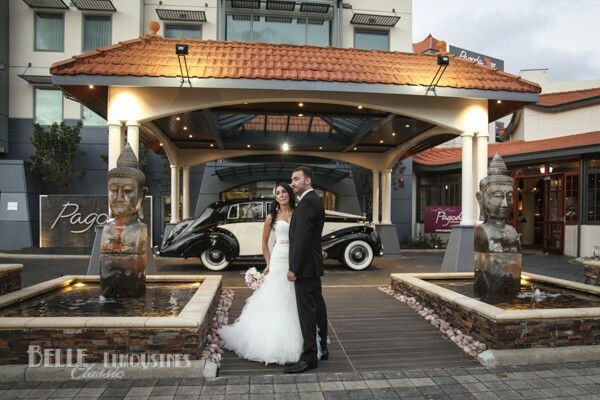 Belle Classic Limousines is honoured to be the preferred limousine supplier at the Pagoda Resort. 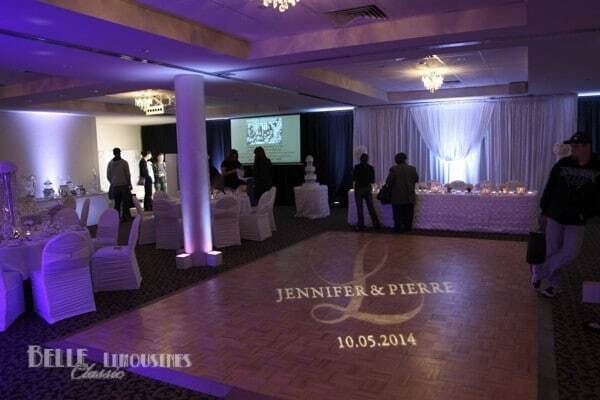 Being a reception venue with accommodation for international or interstate guests makes it a popular venue for couples looking for a simple solution for visiting guests. We often assist with weddings at the Pagoda Resort that involve a pick-up from the resort to the ceremony followed by a feature photographic session and back to the Pagoda for the reception. The covered entrance portico at the Pagoda Resort is very accessible for multiple wedding cars like the Rolls Royce Silver Wraith that features in Pagoda Resort marketing and Chrysler limousines. This is a bonus if you happen to have a rainy wedding day. If the entrance drive is occupied then your limousine will possible park on the street verge which is only a short walk. There is ample secure off road parking for hotel guests at the rear of the Pagoda Resort that are accessed via the gates near the hotel entrance. This parking is limited to guests staying at the resort. One of the benefits of a Pagoda Resort wedding is that guests will often book a room and stay overnight after the wedding. 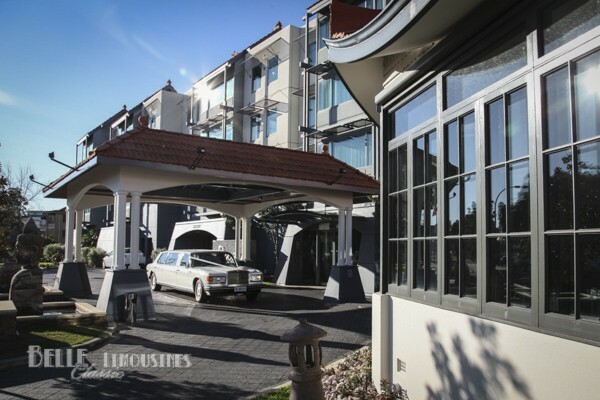 For guests visiting the venue for a wedding or function there is only street side parking with a few short stay bays in the resort entry area. End of wedding night transfers for the bride and groom are rare from the Pagoda Resort as most couples use accommodation on site. If you are planning to head to a different hotel it is wise to pre-book a chauffeur car from the venue to ensure a timely departure. It is always appreciated by guests if they are informed about the benefit of securing a pre-booked transfer from the venue at the end of the night if they are considering using a taxi or Uber car to get home. This should be a must for special guests like parents and grand parents if they are not likely wanting to drive home. Whilst Uber has become a popular short call charter service it is worth remembering that weddings usually wind up between 11.30pm and 12.30am which is the same time frame that hotels, events and other weddings in the area are likely to finish. Whilst these short call services cope well with prompt service at most times they struggle to provide the volume of cars needed at the end of night especially with venues that are a little away form the key hire locations such as Perth city, Crown Casino and Perth Airport. The entry portico at the Pagoda Resort and Spa is large and can easily accommodate wedding cars and stretch limousines like our Chrysler limos when doing wedding pick-ups and drop-offs. The only issue at the Pagoda is that the entry drive through the portico is also the main entrance to the guest parking (through the security gates under the hotel). It is important to be aware of the needs of other guests entering and leaving the venue especially when needing to wait at the venue for several minutes if you arrive early for a bridal party pick-up. If you arrive over 15 minutes early it may be best to park in the street for a period. Ring the bride and inform them you are there and will move into the portico when they are ready to depart. Longer stretch limousines will find it easier to approach the Pagoda Resort from the north with an easier entry into the drive way. If you approach from the south a three point turn may be needed to enter the drive especially if other cars are waiting in the entrance and you will be caught blocking the through traffic heading north and then have the more difficult turn into the venue.